I feel like writing today. I don't want to be lengthy but just to pen down a few words, hopefully a few lines if the mood and the mind are still here with me. Today had been pretty interesting and I realised the more you meet people, the more eloquent you could be. It just needs practice. That was a long conversation and my growling stomach told me it was time to stop and head home. We had a great time though. I wrote minutes for the first time and I guessed I did okay. Next, I want to write a press release. Haha, just kidding. As soon as I got home, I received a message saying Elly had been throwing up for the whole day. I remembered something in the past that slowly crept back out to the surface as I read the message. Saffy had been throwing up and I took that as a bad omen because it did what it did and when I heard about Elly doing the same thing, I could not help but worry. I just hope she gets well soon. Currently engrossed in a novel entitled Before I Go to Sleep by S. J. Watson. I could not imagine spending my life not remembering anything when I wake up the next morning and have to do things all over again for the day, dreading its expiry the moment I close my eyes and sleep. The book is unputdownable, of which the term not suitable for me to use as I am reading the e-book. Still, my eyes could not look away from the screen whenever the PDF file is opened. I guess I shall stop for today. Elly, please don't die just yet. You still have loads of poop to eat. Think about that! My blog has been dead for almost a month now. Again, here is a post to say that I am still alive and kicking. Been in a new position for three weeks now and I am still coping. This whole Communications thing is still too new for me. 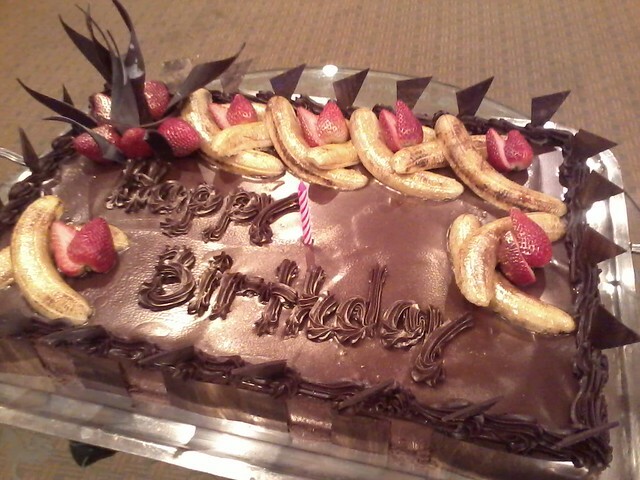 The second day at the new workplace, I joined in the birthday celebration for January and February babies! This was how the cake looked like. Delicious. 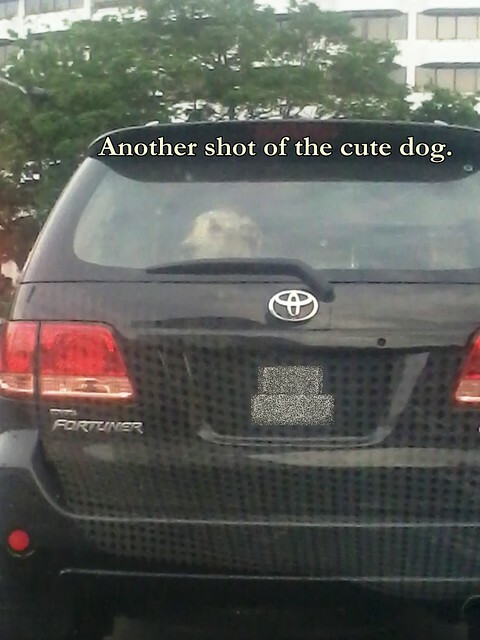 A couple of days ago, I saw this car in front of me with a cute occupant inside. This picture was snapped while I was waiting for the traffic light to turn green while on the way to work. Isn't he/she a cutie? I guessed it was a retriever. 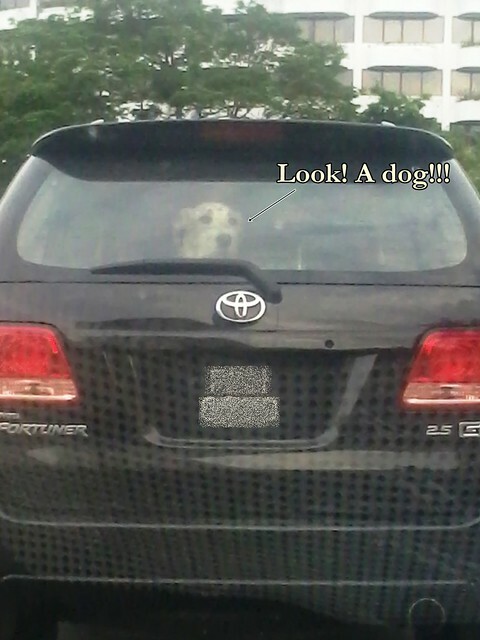 He/She was helplessly looking around while the car was idle. Must be wondering where the owner is taking him/her to. Maybe a visit to the vet? 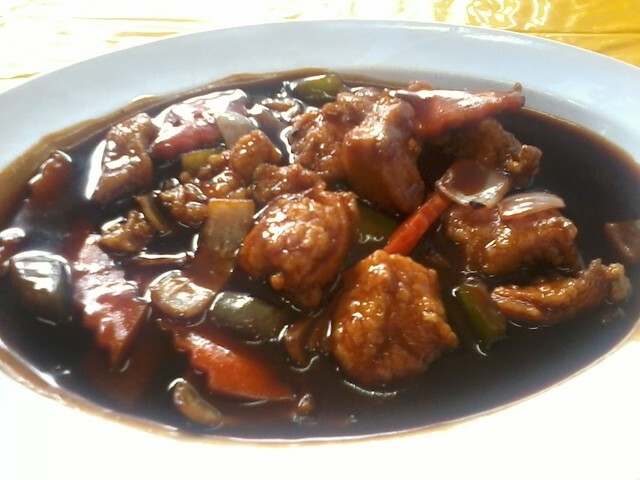 Dinner today was black pepper chicken rice. Only cost me RM4.70. Not too bad. Not only was it yummy but it looked absolutely delicious too. Another great Sunday tomorrow. Hope all of you have a great one too! By the way, tomorrow is also Car Free Day in Penang at Beach Street so if you are here, come and join the crowd!